"World's Apostle of Liberty" by Thomas Paine. in Truman Library copied by a Japanese artist. over 30,033 miles All Across America! Fredericksburg, Virginia Free-Lance Star hometown paper of GW. Greetings of a Standing Ovation by Virginia House of Delegates on George Washington's Birthday (a.d. 2001, 2002, 2006). "Washington" shakes hands with Nixon, Delegate Sam Nixon of Chesterfield. 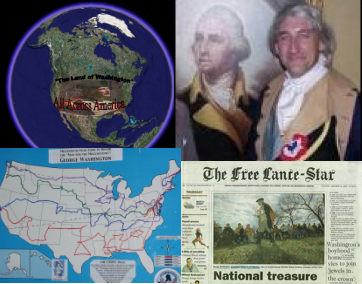 Click on the comments line at the end of each entry to add your comments, and share your insights about the information in general, or on General George Washington. Or send an email to George@WashingtonLIVES.us. Thank you for your time and interest. The entries after the first few are basically entered according to the date, most recent first. Please use the scroll bar on the right of your finder to see the many and varied items of information available here. 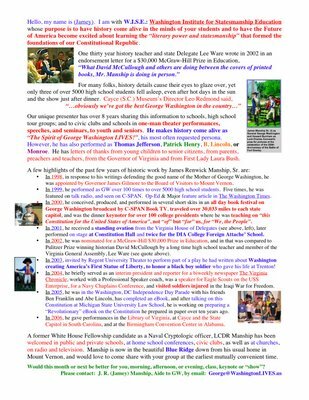 There is a February a.d. 2000 Teaching Journal essay of "Washington: Deist? Freemason? Christian?" that sets the record straight on those contentious questions. Another essay is on the origin of the famous Washington boyhood "Rules of Civility". Another is a Letter to the Editor refuting the erroneous scholarship of an employee of Mount Vernon who wrote a terrible article for Mothers' Day a.d. 1998 titled, "Washington and his mother: No Love Lost", when in truth, Washington was a very loving and loyal son, as his mother was to her son George. That letter reflecting good and true scholarship was read by an aide to Governor Gilmore that resulted in the Governor appointing me to the Board of Visitors to Mount Vernon later in a.d. 1998, where I served for 3 years. In December a.d. 1999, with Michigan State Washington scholar Dr. William Allen as co-author, wrote an article titled "World's Greatest: The Man for the Millenniums - George Washington" with that tells much good information and about a page and a half of the true story of Washington and Slavery, but since such a viewpoint is not "Politically Correct", an email distribution to over 700 publications did not yield one known printing of the very well researched and written article. PC run amok in the media. In a.d. 1999, over 120 performances were given as The Spirit of George Washington LIVES! to over 5000 high school students on tour to Washington, as well as other civic and church groups. Washington came alive in the minds, hearts, and lives of the future leaders of America! Also there are links to other related Washington LIVES! websites at several places, and nicely gathered together at www.HistorySC.com where we had a smashing good show when General Cornwallis surrendered his sword after 225 years of waiting. Create your own link by clicking the link line. Come back again, and tell your friends by clicking on the envelope to access a form where you can send a link to page from this site you like, along with a short message. "History is an essential study to better government." Have fun preparing yourself as you learn more about Washington so to know how to work for a better government, indeed a better America for us all.